The opening of Kambri has been delayed due to this week’s rain. The precinct was scheduled to open today, but now will open on 11 February. The precinct had been slated to open to the public today. This was being advertised as late as last week, with the Kambri at ANU Facebook page posting on 1 February that the precinct would open in “less than a week”. The 7 February date has also been on bus stops, in articles, and advertised by various ANU Facebook pages. 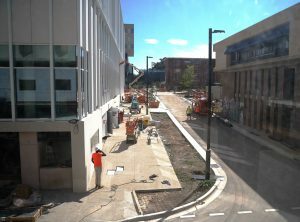 When contacted for confirmation of the opening date on Tuesday 5 February, the University told Observer the precinct would open “this week”. Monday’s storm caused Sullivan’s Creek to rise significantly. The scheduled opening date of 7 February was itself later than originally planned. 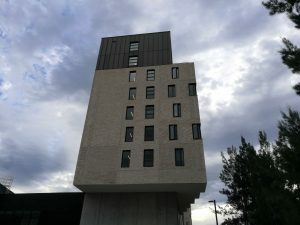 In September 2018, then Deputy Vice-Chancellor (Academic) Marnie Hughes-Warrington stated the project was running on time, with the first building to be completed on 2 December and the last on 30 January. 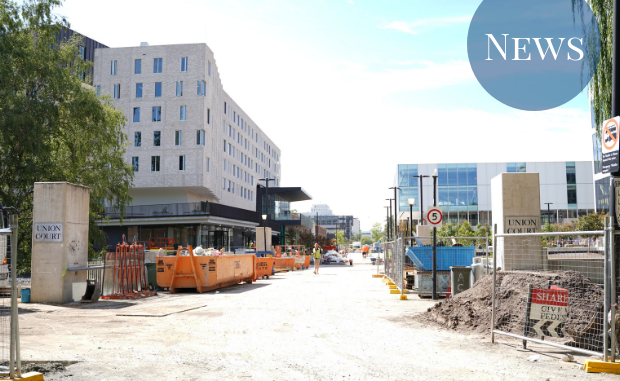 Both the University and Lendlease stated last year that the precinct itself would open on 1 February. 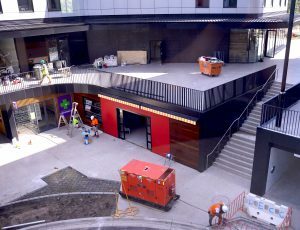 In June 2018, a Lendlease spokesperson assured Observer that 1 February would be the date the precinct was fully completed, including finishing touches such as landscaping. However, Vice Chancellor Brian Schmidt noted that “your results may vary…if we get anymore floods…”. This was a reference to last year’s floods, which Schmidt said delayed the development by three weeks. 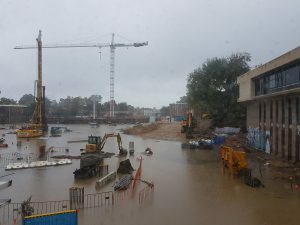 The view from Chifley during last year’s flood. The precinct is not yet ready for vendors to move in, so the Pop-Up will stay open for the weekend. PARSA President Zyl Hovenga-Wauchope said the delay is “not wholly unexpected”, but that he is sure “the people working on the site are working very hard”. He said PARSA’s O-week plans are “largely unaffected” by the delay. Due to the delayed opening of Kambri, ANU has given permission for Pop-Up vendors to remain open over until 9 February. Observer understands that vendors signed lease extensions yesterday, the day they were set to expire. Only a select few of the current vendors are moving to Kambri. Fenner Hall is open and mostly complete. The opening of the new Fenner Hall was not delayed by the deluge. Residents moved into their new home yesterday, albeit with the fit-out not fully completed. 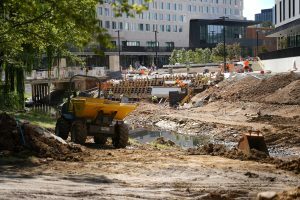 Observer understands that multiple residents’ rooms do not yet have sinks, and some areas are off-limits due to their connection with still-under-construction areas of Kambri. Kambri will open on Monday 11 February, with a celebratory concert beginning at midday. ANUSA did not respond to a request for comment before publication. Know something we don’t know? Email [email protected] or use our anonymous tip submission. If you have an issue with this article, or a correction to make, you can contact us at [email protected], submit a formal dispute, or angery react the Facebook post. Want to get involved? You can write articles, photograph, livestream or do web support. We’re also looking for someone to yell “extra!” outside Davey Lodge at 1AM. Apply today! Stay informed about campus news and events through our weekly newsletter, delivered right to your inbox!